A young, talented musician from Burton-in-Kendal has gained the confidence to earn a place at the renowned Junior Royal Northern College of Music (Junior RNCM) in Manchester. Charlotte Burrows, aged 12, received £500 from the Johnson Fund to help pay for music lessons and exam fees in preparation for her audition at the Junior RNCM. Charlotte, who is home schooled, had been looking to further her musical training, but due to the cost of music lessons and exams, was unsure how she was going to get the grades she needed to get into music school. 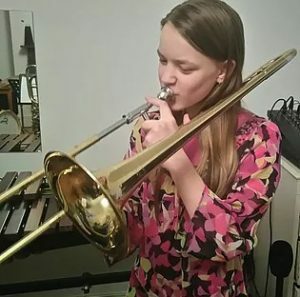 Thanks to the funding she obtained distinctions in each of the 3 music exams she was studying for: Grade 6 Trombone, Grade 6 Piano and Grade 5 Voice. Charlotte’s mother, Julie, said: “She loves performing, particularly with others, as that is what brings the music alive, but playing in public is also what requires her to continue with lessons so she can learn and improve. Charlotte is well known in her community for her musical talent as she sings in the local choir and plays her instruments in the two churches of Burton and Holme during Sunday services and at social events. She regularly plays bass trombone with the Kirkby Lonsdale Brass Band, as well as playing tenor trombone with the Lancaster Music Centre Showband, where she is regularly picked as a soloist. She also plays in a jazz trio, Blue Slate, with her two siblings. Taking the exams and performing for her audition were challenging, but she overcame the challenge with plenty of practice and preparation. Charlotte started at the Junior RNCM in September 2016, and is hoping to continue her musical studies there until she is 18; from there she hopes to pursue a musical career.